Ohio Wesleyan’s OWjL Camp brings together middle school students from 10 central Ohio counties for classes such as ‘You Are What You Eat’ (shown here). The program has earned its second consecutive grant from the Ingram-White Castle Foundation. EVANSVILLE, IN (02/21/2019)— The University of Evansville has announced those students accepted to UE for the Fall 2019 semester. They include: Brandon Hibbitts of Galena, OH (43021); Zachary Ryan of Westerville, OH (43082); Charlotte Sprecher of Galena, OH (43021); Ian Taylor of Sunbury, OH (43074). Located in Evansville, Indiana, the University of Evansville is a private, comprehensive university with over 80 majors and more than 100 areas of study in the arts and sciences and pre-professional programs. UE’s diverse student body represents 44 states and 56 countries. UE is the first in Indiana to be designated as an Ashoka U Changemaker Campus, and its changemaking culture empowers students to improve the world around them. U.S. News & World Report recognizes UE as the number 7 Best College in the Midwest among private schools and one of the top 10 best value schools in the Midwest. For more information, please visit www.evansville.edu. FINDLAY, OH (02/22/2019) — The University of Findlay Symphonic Band and Wind Ensemble recently performed “Disney Goes to the Movies.” The band performed music from “Pocahontas,” “Beauty and the Beast,” “Planes,” “Aladdin,” “Mary Poppins” and other favorites. The annual winter concert was directed by Jack Taylor, University professor of music. Local students include: Rachel Renz of Galena (43021); Alivia Olson of Westerville (43081). FINDLAY, OH (02/18/2019) — The dean’s list for the fall 2018 semester at the University of Findlay has been announced. To earn this achievement, a student must attain a grade point average of at least 3.5 on a 4.0 scale. Local students include: Jonathan Allen of Westerville (43081); Kathleen Fullin of Westerville (43082); Emma Graham of Sunbury (43074); Cecelia Klein of Westerville (43081); Chloe Marburger of Westerville (43082); Kate Miltko of Westerville (43082); Alivia Olson of Westerville (43081); Alyssa Parsio of Galena (43021). FINDLAY, OH (02/27/2019) — Cecelia Klein, of Westerville, 43081, will participate in the IHSA Regional Tournament to be held March 2 at the University of Findlay. FINDLAY, OH (03/11/2019)— Cecelia Klein, of Westerville, 43081, a member of the University of Findlay’s IHSA Western team, will compete individually in the 2019 IHSA Semi-Final Tournament to be held March 16-17 at the Unversity of Findlay. Students qualified for this level of competition by placing first or second in their event during the 2019 IHSA Regional Tournament. ATLANTA, GA (02/13/2019)— The Georgia Institute of Technology presented degrees to approximately 3,600 undergraduate and graduate students during the Institute’s 256th Commencement exercises on December 14-15, 2018, at the McCamish Pavilion, including: Marinice Bauman of Galena (43021) — Bachelor of Science in Literature, Media, and Communication; Adam Smith of Westerville (43082) — Master of Science in Computer Science. One of the nation’s leading research universities, the Georgia Institute of Technology is in the business of creating the next — the next idea, the next technology, and the next legion of agile minds well equipped to imagine and engineer our future. More than 25,000 undergraduate and graduate students are enrolled, and Georgia Tech is ranked in the nation’s top 10 public universities by U.S. News and World Report. For more information visit www.gatech.edu. ATLANTA, GA (02/14/2019)— Cassidy Ryan of Galena (43021) was named to the Fall 2018 President’s List at Georgia State University. To be eligible for the President’s List, degree-seeking students must have earned a GPA of at least 4.0 for a minimum of nine semester hours of academic credit taken at Georgia State during the fall or spring term with no incompletes for the semester. Eligible students must have a minimum GPA of 2.0 for all classes taken at Georgia State. DELAWARE, OHIO – The Ingram-White Castle Foundation is awarding Ohio Wesleyan University’s OWjL Camp a three-year $11,250 grant to provide scholarships for talented and gifted middle school students selected to attend the weeklong academic camp. Each summer, Ohio Wesleyan hosts three week-long residential sessions of OWjL Camp for sixth-, seventh-, and eighth-grade students from Delaware, Fairfield, Franklin, Knox, Licking, Madison, Marion, Morrow, Pickaway, and Union counties. Students attending OWjL Camp select courses from an academic program that includes mathematics, logic, computing, science, humanities, and creative development. Cultural, recreational, and social activities round out the experience. ROCHESTER, NY (02/14/2019)— The following local residents made the Dean’s List at Rochester Institute of Technology for the 2018 Fall Semester: Alex Aquilina of Galena (43021), who is in the game design and development program; Gabrielle Robinson of Westerville (43082), who is in the ASL-English interpretation program; William Steele of Westerville (43081), who is in the game design and development program. LORETTO, PA (02/14/2019)— Evan Feltz, Marketing major, from Westerville, was named to the Dean’s List at Saint Francis University. Feltz was among more than 550 students named to the Dean’s List for the Fall 2018 semester. To achieve this list, a minimum quality point average of 3.500 must be earned on 12 or more credits during a single semester, with no continuing or incomplete grades. Saint Francis University (www.francis.edu) in Loretto, PA is the oldest Catholic-Franciscan college in the United States. Its mission is to help students grow into compassionate, successful professionals through a culture of generosity, respect, discovery and joy. CANTON, NY (02/25/2019)— Erin Lescinsky of Galena has been selected for inclusion on St. Lawrence University’s Dean’s List for academic achievement during the Fall 2018 semester. Lescinsky is a member of the Class of 2020 and is majoring in global studies. Lescinsky attended Big Walnut High School. About St. Lawrence University: Founded in 1856, St. Lawrence University is a private, independent liberal arts institution of about 2,500 students located in Canton, New York. The educational opportunities at St. Lawrence inspire students and prepare them to be critical and creative thinkers, to find a compass for their lives and careers, and to pursue knowledge and understanding for the benefit of themselves, humanity and the planet. Through its focus on active engagement with ideas in and beyond the classroom, a St. Lawrence education leads students to make connections that transform lives and communities, from the local to the global. Visit www.stlawu.edu. 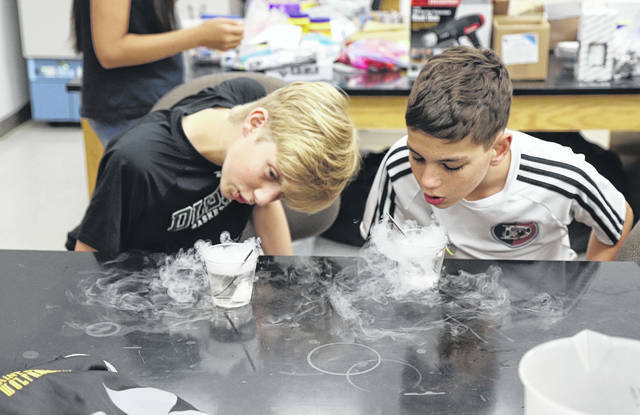 https://www.sunburynews.com/wp-content/uploads/sites/48/2019/03/web1_OWjL-Camp-Photo-by-Kirsten-Whitford-19-.jpgOhio Wesleyan’s OWjL Camp brings together middle school students from 10 central Ohio counties for classes such as ‘You Are What You Eat’ (shown here). The program has earned its second consecutive grant from the Ingram-White Castle Foundation. Information for this story was provided by OWU and readMedia Newswire.